Imbalzano, E., et al. Resistant Hypertension and Paroxysmal Supraventricular Tachycardia in Carotid Paraganglioma. (2014) J Heart Cardiol 1(1): 6-7. ©2014 Imbalzano E. This is an Open access article distributed under the terms of Creative Commons Attribution 4.0 International License. Carotid paragangliomas (CP) are neuroendocrine tumors, wich are usually benign, and are derived from the parasympathetic nervous system[1-3]. They usually do not secrete catecholamines and are asymptomatic, but in rare cases headache, sweating, palpitations, anxiety and arterial hypertension have been described[4-7]. A 38 year-old woman presented at the emergency room; she was experiencing episodes of paroxysmal supraventricular tachycardia (PSVT) and was in hypertensive crisis. She had a two-year history of resistant hypertension , with a blood pressure (BP) of 210/120 mmHg, wich was not controlled by four blood pressure medications (a combination medication containing candesartan 32 mg/d and hydrochlorothiazide 25 mg/d, plus amlodipine 10 mg/d and spironolactone 25 mg/d). She was a smoker who experienced recurrent episodes of PSVT. She had previously undergone a workup for secondary causes of hypertension such as: endocrine, renal, and vascular disorders. An electrocardiogram showed PSVT with a pulse rate of 200 (Figure 1a) and an echocardiogram revealed moderate left ventricular hypertrophy (LVM = 118 g/m2). After lowering her blood pressure, in an attempt to stop the PSVT we decided to employ carotid sinus massage; however when we placed our hand on her neck we palpated a small pulsatile tumefaction with a suspected aneurysm. Therefore we did not use carotid massage and stopped the PSVT with IV adenosine administration. Routine biochemical and haematological analyses were normal. Color Doppler ultrasound (CDUS) clarified that the neck lesion was not an aneurysm, but a hypoechoic, highly vascularized mass (Figure 1 b and 1c) located at the right carotid bifurcation. We suspected that the lesion was a CP. Subsequently a computed tomography (CT) was performed that confirmed the diagnosis of a CP. The CT showed the infiltration of the carotid artery (Figure 1 d and 1e) and surgical removal was recommended. The morphology and immunohistochemical profile were also indicative of a CP. We ruled out a catecholamine-secreting tumor, because the tumor cells were negative for the neuroendocrine markers: chromogranin A and sinatophysin. Her plasma norepinephrine, dopamine and chromogranin A levels were negative. Figure 1: (a) Electrocardiogram shows PSVT with 200 pulse rate. (b) CDUS imaging of a nodular, oval, solid and hypoechoic mass of dimensions are 21.7 × 16.4 mm. 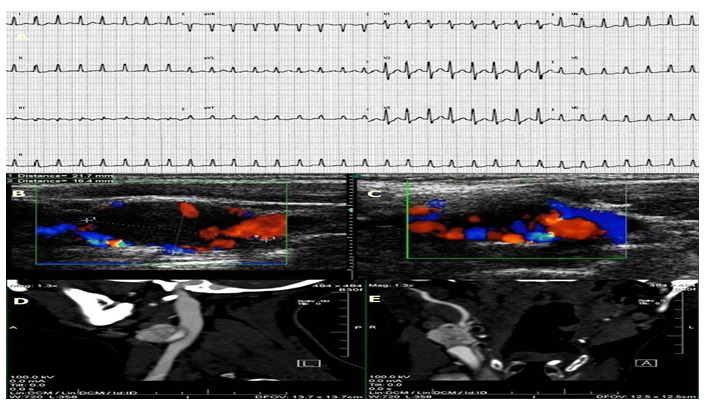 (c) the mass located near the right carotid bifurcation appears highly vascularized. (d) CT confirmed a large solid hypervascular mass in the right lateral-cervical region, on the internal carotid artery near to bifurcation. (e) describes infiltration of the internal carotid artery. After five days of hospitalization without any complications, the patient was discharged. Ambulatory blood pressure monitoring (ABPM) and 24 hour Holter monitoring were employed at three, six and twelve months; they documented a normal BP and no recurrent arrhythmia. Only therapy with low doses of beta-blockers was suggested. After the surgical removal of the CP the patient was asymptomatic and her arterial hypertension was well controlled. We determined that the PSVT and arterial hypertension were related to parasympathetic and sympathetic phenomena due to the infiltration of the carotid vessels, even though her symptoms suggested a adrenergic crisis for release of catecholamines. 1. Khan, M.F., Datta, S., Chisti, M.M., et al. Cardiac paraganglioma: clinical presentation, diagnostic approach and factors affecting short and long-term outcomes. (2013) Int J Cardiol 166(2): 315-320. 2. Harbeck, B., Joost, A., Lehne, W., et al. A hypertensive patient presenting with paraneoplastic perimyocarditis and myositis due to pheochromocytoma. (2012) Int J Cardiol 160(2): e23-e24. 3. Shah, U., Giubellino, A., Pacak, K. Pheochromocytoma: implications in tumorigenesis and the actual management. (2012) Minerva Endocrinol 37(2):141-156. 4. Al-Salameh, A., Cohen, R., Chanson, P., et al. Update on endocrine hypertension. (2012) Ann Endocrinol (Paris) 73(1): S26-S35. 5. Mandraffino, G., Imbalzano, E., Sardo, M.A., et al. Circulating progenitor cells in hypertensive patients with different degrees of cardiovascular involvement. (2014) J Hum Hypertens 28(9): 543-550. 6. Samji, K.B., Crown, A.L., Buxton-Thomas, M.S., et al. Necessity for long-term follow-up of patients with head and neck paraganglioma and mutation in the succinate dehydrogenase genes: an index case report and literature review. (2012) Endocr Pract 18(5): e130-e134. 7. Imbalzano, E., Saitta, A., Lamari, A., et al. Echo-Doppler evaluation of recent onset chronic venous insufficiency in elderly patients: does the heart have a role? (2013) Recenti Prog Med 104(11): 569-573. 8. Dudenbostel, T. Resistant hypertension-complex mix of secondary causes and comorbidities. (2014) J Hum Hypertens 28(1): 1-2. 9. Calhoun, D.A., Jones, D., Textor, S., et al. Resistant hypertension: diagnosis, evaluation, and treatment. A scientific statement from the American Heart Association Professional Education Committee of the Council for High Blood Pressure Research. (2008) Hypertension 51(6): 1403-1419. 10. Mannelli, M., Lenders, J.W., Pacak, K., et al. Subclinical phaeochromocytoma. (2012) Best Pract Res Clin Endocrinol Metab 26(4): 507-515.